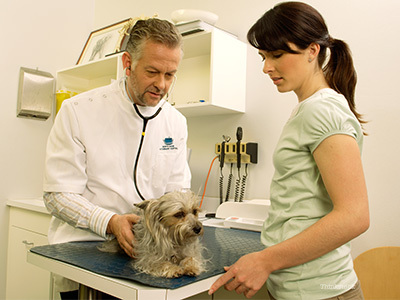 Dr. Ernie Ward gives you five questions to ask during your next veterinary visit. For more from Dr. Ward, find him on Facebook or at www.drernieward.com. As a practicing veterinarian for over twenty years, I’ve learned a learned a few tricks to best help my pet patients stay healthy and avoid illness. There are five key areas I try to cover during each annual exam. To optimize your pet’s next routine appointment, I suggest you jot down your own version of these five simple questions. By preparing questions you want answered before you go, you’re less likely to forget them during the time crunch that hampers many visits. 1. What should I feed my pet? The most important health decision you make each day for your pet is what you feed it. Even if you have no plans on changing food, have a conversation about nutrition with your vet. New research, diets, and your pet’s health vary over time. Let your vet know you’re interested in discussing your pet’s diet. For my patients, food is the foundation of good health. There’s simply no better source of pet nutritional information than an informed and interested veterinarian. Ask that question. Seemingly insignificant behavioral issues can escalate into serious troubles in very little time. Today’s barking and whining can lead to tomorrow’s destroyed couch or injured neighbor. Don’t be embarrassed; the majority of pets I treat have at least one behavioral issue their owners would like to improve. Heck, I’m always working on my pets (and myself). There’s nothing too silly or trivial to bring up if it’s nagging you. Nipping problem behaviors in the bud can prevent future dangerous or destructive habits. Besides, I’d rather work on correcting minor issues instead of complex and deep-rooted problems. 3. Am I exercising my pet enough? Along with feeding a healthy diet and maintaining good behavior, physical activity is key to a long and happy life. Tell your vet (truthfully) how much (or how little) you exercise your dog or cat. Your vet isn’t there to judge you; she’s there to help. As little as 15 to 30 minutes a day for dogs and two or three five-minute play periods for cats is all it takes. 4. Can you find anything wrong with my pet? Don’t stop at “Everything looks good.” What about this little lump or that mole? Did the hips and shoulders feel normal? Is that dark spot on Rover’s rear normal? Details, people, details, that’s what I’m interested in. No three-minute physical examinations; it takes me about six to nine minutes to adequately investigate my patients from nose to tail. Make sure your vet records any tiny imperfections to track any changes next year. Today’s dark spot could be tomorrow’s melanoma. I hope not, but I want to know. And so do you. Early detection can be the difference between life and death. 5. What about issues we can’t see? During an exam I’m limited by what you tell me, my experience, and our five senses. That leaves a lot of unknowns. That’s why I always advise my pet parents to have basic blood and urine tests each year. These tests are the only way I have to uncover hidden disease. You can’t “see” liver or kidney disease, anemia, or diabetes until things are very, very bad. If you address these five questions, your pet is will be well on its way to maintaining optimal health. Write them down, don’t be afraid to ask tough questions, and above all, have your pet examined at least once a year. After all, the real value of a doctor’s appointment is learning how to stay out of the hospital.